My advice would be to make it up with whatever you can get to start with. If you’d like to add more ingredients in future you can do so, perhaps one at a time to see how each improves the recipe’s effectiveness in treating your arthritis symptoms. Delicious pineapple is full of vitamin C which is a powerful free radical for reducing inflammation within your body. However a more important component for treating rheumatoid arthritis and other forms of joint pain is the proteolytic enzyme bromelain, found primarily in the core of this tropical fruit. Concentrated bromelain enzymes have been used successfully to treat osteoarthritis in scientific studies, but you can also get bromelain by blending up fresh pineapple with the core included in your smoothies. Extra-virgin coconut oil with its powerful polyphenols and lauric and capric acid is often recommended as both an osteoarthritis and rheumatoid arthritis treatment. In fact, this study found that the polyphenolic fraction of virgin coconut oil specifically protected against the expression of inflammatory genes like COX-2, iNOS, TNF-a and IL-6 that are involved in producing arthritic pain. Full of important fatty acids that your body needs to function properly, a powerful anti-inflammatory and even excellent for weight loss, extra-virgin coconut oil like this one I use is a superfood worth taking daily, either by the spoonful or in a smoothie recipe like this. Far more than just a garnished, parsley is great in healthy green smoothies and for the purpose of treating arthritis it contains some powerful nutrition. This dark green herb is high in vitamin K for proper calcium metabolism, antioxidant vitamin C, beta-carotene, quercetin and other flavonoids and potent anti-inflammatory volatile oils like myristicin. Carrots are used in traditional Chinese medicine for painful joints and are believed to assist in healing the ligaments and bringing relief for joint pain. Chock-full of powerful antioxidants, vitamins and minerals, carrots are also an excellent alkalizer of your body, helping to reduce acidic conditions that promote inflammation. Always look for organic carrots where possible as this root vegetable absorbs both good and bad from the ground it’s grown in. Fortunately carrots aren’t usually that much more for organic and well worth looking for. You’ll need a good blender to blend up root vegetables like carrots properly in smoothie recipes, but it’s well worth it if you value your health. I’ve used this amazing bestseller in my kitchen for years and it makes short work of even the hardest ingredients. These sweet berries are actually surprisingly good for you and contain powerful anti-inflammatory and antioxidant anthocyanins. Also rich in vitamin C that combats inflammation from free radicals, strawberries are a great tasting addition to this smoothie for joint pain. A Harvard School of Public Health study found eating strawberries reduced levels of C-reactive protein in the blood. C-reactive protein is a strong marker of inflammation and often spikes during rheumatoid arthritis flare ups. Unfortunately strawberries are regularly sprayed with pesticides. If you can’t get them organic then make sure you soak them in hot water and a splash of apple cider vinegar for a minute to greatly reduce any chemicals on them. Humble celery is another common but unusually powerful anti inflammatory food, full of nutrients like luteolin that has been suggested in studies as a potential osteoarthritis treatment. Celery juice is often recommended on arthritis forums but blended celery is even better as you are getting all of the vegetable in an easily assimilated form. Also known as a natural diuretic, including celery in your diet can assist with flushing uric crystals out of your body that can otherwise accumulate around your joints and contribute to joint pain and arthritis symptoms. Like strawberries, celery can be sprayed so if you can’t find it organic then soak it with the strawberries in hot water and a small amount of apple cider vinegar. A quick scrub afterwards with a scrubbing brush can also help. Bright orange turmeric contains a substance called curcumin which has been shown in scientific research to reduce the pain and stiffness of both rheumatoid arthritis and osteoarthritis. Curcumin blocks inflammatory cytokines like COX-2 that are involved in the processes responsible for arthritic pain and is an all-round beneficial superfood with noticeable benefits against heart disease, cancer and of range of illnesses beyond arthritis. Many people take capsules daily but it is inexpensive to get high curcumin powdered turmeric like this and add it to both savory food recipes and drinks. Turmeric has a mild flavor and with all the other great tasting ingredients you won’t notice it beyond the orange tinge of your smoothie. Many arthritis sufferers have experienced improvement in mobility and significant reductions in arthritic pain and inflammation when they have ginger regularly. A pungent herb with many health benefits, the inflammation fighting gingerols in ginger are believed to be primarily responsible for this effect. Fresh ginger is great in this anti inflammatory smoothie and gives an energizing kick to the flavor. If you don’t like ginger yet perhaps try it with a smaller piece at the start and slowly increase it over time. 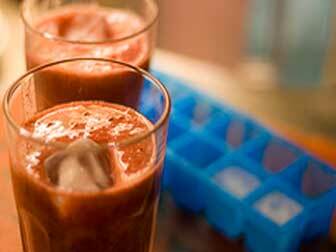 Its powerful effects on arthritis certainly make it well worth adding to this smoothie recipe. One important thing to note with ginger is that it can have a mild blood thinning effect. This is generally a good thing but discuss this with your doctor if you are currently taking blood thinning medication and avoid taking them at the same time as a smoothie with ginger in it. A quarter of a pineapple skinned and chopped. The top and bottom of the pineapple and especially the core are best for arthritis treatment. 2 branches of parsley, chopped. 1 organic carrot, scrubbed and chopped. A handful of strawberries, preferably organic, green tops removed. 1 celery stalk, preferably organic, soaked and scrubbed. 1 teaspoon of turmeric, go for high curcumin powder like this. A quarter to half inch piece of fresh ginger, chopped finely. Healthy ‘milk’ of your choice. Almond or hemp milk is good, as is probiotic kefir or real unflavored and bio-live yogurt. Coconut water or a mixture of half coconut milk in half water is an excellent option. Avoid soy milk due to estrogenic compounds and if you choose cow’s milk then organic is the best option. Optional – Stevia for healthy sweetness. Optional – Add even more inflammation fighting polyphenols with this potent Vital Reds powder. Chop off the green tops of the strawberries. If not organic then soak the strawberries, parsley and celery in hot water with a splash of apple cider vinegar for a minute. Drain and add the strawberries to the blender. Chop up the parsley stalks and throw them into the blender jug along with the heads. Scrub the celery and carrots under hot water. Chop both of them up to a size your blender can handle and throw them into the blender jug. A couple of inches is fine for a powerful blender like this one. Much smaller is needed for weaker blenders. Skin and chop up the pineapple into chunks your blades can handle. If you’re chopping the whole pineapple, use the top and bottom pieces and keep the rest for eating. If you don’t eat the core of the pineapple normally you can keep them in a container in the fridge to use specifically for this inflammation smoothie recipe. Add the coconut oil, turmeric and ginger and pour whatever ‘milk’ you’ve decided to use until it reaches half way up your blender jug. Hold down the lid and blend on high until the consistency looks finely mixed. The combination of the strawberry pink, parsley green and carrot and turmeric orange does turn this smoothie an interesting color. It tastes great though and is great for your body, not just for arthritis but also against a whole host of other health problems involving inflammation. Some people notice a reduction in arthritis symptoms soon after taking the individual superfoods in this inflammation smoothie recipe like coconut oil or ginger, or using turmeric or anti-arthritis bromelain capsules like these. By combining them in this way into an easily digestible and assimilated drink the beneficial effects should be even more pronounced. The best time to make and drink this smoothie for painful joints would be at least an hour before you usually experience your worst arthritis symptoms. So if this is in the morning then try this smoothie for breakfast. If the afternoon is when joint pain usually comes on then have it for lunch. Or if evenings are when your arthritis is at its worst then try it before dinner. As an added bonus you’ll probably feel like eating less as well. There’s more on how to treat arthritis naturally here and I’d appreciate any comments, questions or especially results if you make up this smoothie for arthritis and inflammation yourself. There’s even more delicious smoothies for various health conditions here. Try this anti inflammatory smoothie recipe or another one of those superfood smoothies and you’ll see that good medicine really doesn’t have to taste bad. It can actually be something you look forward to making. Thank you for this information just what I need got a new extractor juicer and this page will be my assistant !! Thanks again keep up the good work. nutrition info from reliable sources backed by research. Have any recommendations on blenders? the nation’s health care bill in half if we could get every one to follow your advice. Thank you for the positive comments Roger. I really like smoothies and have them virtually every day. I’m also always experimenting and looking for different smoothie recipes. This is a very good blender https://superfoodprofiles.com/go/1000watt-blender-amazon and you’re definitely right that the nation’s health care bill would be drastically reduced if people starting eating more superfoods and drionking smoothies. Thanks for your positive comments Mary. Can you make the Superfood Smoothie to treat arthritis on a night time and put in the fridge to drink the following morning for breakfast? It’s just that I wouldn’t have time in a morning to make it before work. You could, though it will lose a little of the more fragile nutrients. I’d definitely recommend making it with half coconut milk half water rather than milk too, which would probably curdle overnight due to the pineapple. Perhaps taking it in the evening before dinner would both help to fill you up and eat less and act as an overnight treatment to help combat arthritis inflammation. I have been battling with arthritis for almost two years. It’s a daily struggle for me. Many times I choose pain over pills. I have been looking for a more natural solution for months now. I’m excited to try this. Thanks for sharing! Thanks for your positive comments Kim and I hope it works well for you. Nice recipe. I wonder if you got a blend for quality night time sleep. Great job. Hi Yemi and thanks for the suggestion. I think a smoothie recipe for better sleep would be a good idea. I’ll do some testing. what is the high curcumin turmeric you refer to? i didnt see a link for it…trying the smoothie now…grew carrots this year and will add these plants to the list for next plantings if it works ! Thankyou ! Thank you for this information going to try.God bless. I found your recipes and information balanced and helpful – I was simply looking for information on pawpaw seeds initially, but liked what I was reading. I wondered as I read if you had anything to say about natural foods/supplements and stress reduction? I am planning a long flight in August and in the run-up would like to boost my resistance to the physical stress I experience when I fly long sectors. Ideally something I could take with me for an in flight pick me up would be very helpful, too. Any ideas? Thanks. A good natural antioxidant source like amla https://superfoodprofiles.com/what-is-amla would help to boost your resistance during the flight and help with recovery afterwards. I use goats milk…is that okay? Yes goat’s milk is usually better than cow’s milk.